By Emily Schultheis, Huff Post. 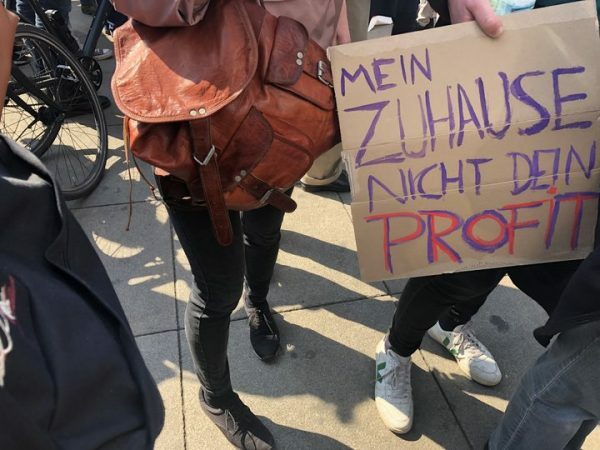 Thousands of people took to the streets in Germany’s capital city on Saturday to protest the rapidly rising cost of apartments in Berlin. “There were old people, young people, families, there were even homeowners … it was basically a snapshot of the entire population of Berlin,” said 77-year-old Barbara von Boroviczény, one of the activists involved in organizing the protest as part of grassroots campaign group Expropriate Deutsche Wohnen & Co.
Berlin, like many cities around the world, is in the tight grip of a housing crisis. For many years, it was seen as a cheap haven for artists and travelers. After the fall of the Berlin Wall in 1989 and Germany’s reunification, rents in the formerly divided city remained significantly lower than other major German cities, as well as many other cities across Western Europe. But things are changing. In the last 10 years alone, monthly rents have more than doubled. And there is no end in sight, with population growth expected to continue in the coming years: Berlin, currently home to 3.7 million people, is projected to pass the 4 million mark by 2025. But, unlike many other cities, Berlin’s politicians, residents and activists are pitching radical ideas to try to address the housing crisis, including a ban on mega-landlords and a rental freeze. 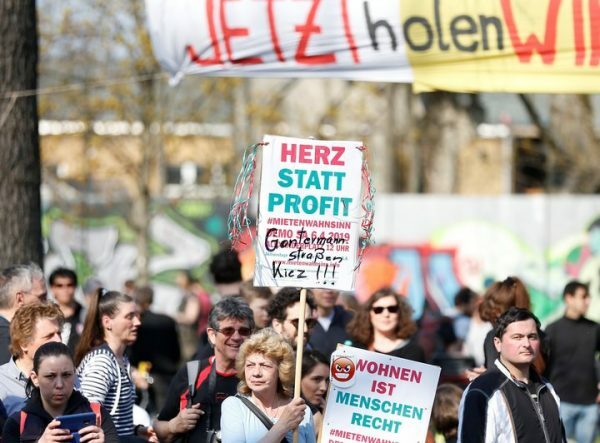 The push to eliminate mega-landlords is spearheaded by Expropriate Deutsche Wohnen & Co., which was set up last year to protest the power of Deutsche Wohnen, Berlin’s largest landlord. The company owns more than 100,000 apartments in the capital and has started implementing steep rent increases on some tenants. The campaigners are calling for a law to ban any rental companies owning more than 3,000 apartments from operating in the city. Those holding more units, like Deutsche Wohnen, that want to stay in Berlin would have their excess housing units bought by the city and converted into public housing. Von Boroviczény said the campaign received more than 15,000 signatures in support of the proposal just last weekend. Under the city rules, 20,000 signatures are needed to get to the first stage of an official referendum process. Once this has been achieved, about 170,000 signatures would be needed within a four-month window to trigger a referendum. Big ideas to address Berlin’s housing woes aren’t just coming from activists. As the idea of scaling back the power of mega-landlords continues to be debated, the city of Berlin is buying up apartments in the hopes of selling them to local housing associations. The city government has bought more than 1,100 apartments since 2015 and is negotiating to purchase approximately 2,600 more. And in January, local politicians from the center-left Social Democrats (the SPD), which governs Berlin in coalition with the Greens and the Left Party, proposed freezing existing rents in the city for the next five years ― a proposal known as a Mietendeckel. Housing is “the biggest, most dominant problem in Berlin,” said Julian Zado, deputy head of the Berlin Social Democrats and one of the politicians behind the rent freeze proposal. “Everyone is affected by it in some way. And it’s a problem that is not easily solved,” he added. Zado believes the rent freeze could help ease pressure on renters until a spate of new housing can be built in the city. 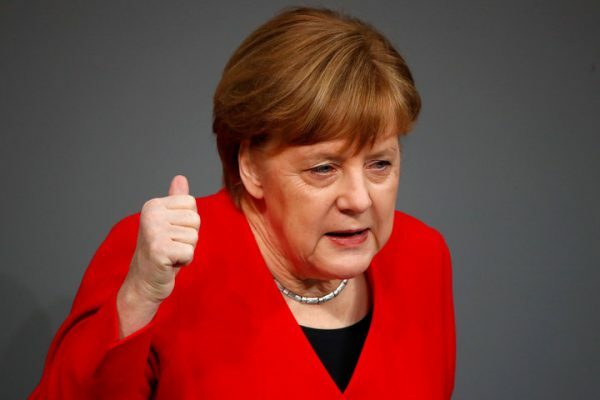 While the Left Party supports the campaign and some from the Green party have also said they’re open to the possibility, the biggest parties in the federal parliament, Chancellor Angela Merkel’s Christian Democrats and the SPD, are opposed. Merkel addressed the issue this week, telling Germany’s parliament that it is the “wrong way” to solve the problem of rising rents. As for the rent freeze, some housing experts have said the Mietendeckel could discourage new construction in the city, or make developers look to sell apartments rather than rent them out. But public support for these measures is high. Two-thirds of city residents would support the five-year rental freeze, according to recent polling. The proposal to break up large rental companies has also received support, with 44 percent of Berliners supporting the idea versus 39 percent opposing the plan, according to one survey. 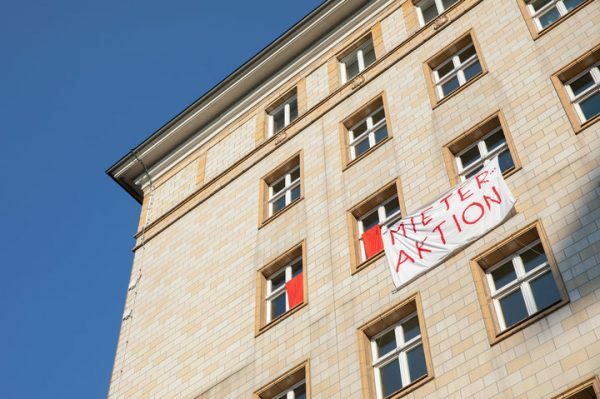 Tenants protest the sale of apartments in several housing complexes along Karl-Marx-Alee by hanging banners and yellow and red flags outside their windows in Berlin, Germany, April 6, 2019. There is no real counterpart in the U.S. to what Berlin is doing, said Scally. For a start, unlike in Berlin, American cities don’t have the same tradition of social housing. Berlin also has an exceptionally high proportion of residents who rent their homes or apartments (approximately 85 percent) unlike the U.S., where there is a stronger trend toward home ownership. “I haven’t heard of any … other large cities trying to tackle this issue not only from multiple fronts, but through these particular mechanisms,” Scally said. Despite this, some cities and states are taking proactive steps to tackle their affordable housing crises. In Oregon, lawmakers recently passed a statewide rent control law capping annual rent increases at 7 percent (plus inflation). The law also makes it harder for landlords to evict their tenants without cause after the first year. The city of Minneapolis has passed groundbreaking reforms to its zoning laws to encourage the construction of affordable housing and promote racial equity. By allowing the construction of multi-unit buildings in areas previously zoned solely for single-family homes, officials hope they can open up the market and spread out population growth throughout the city. Though the proposals in Berlin are certainly radical, it’s still too early to tell whether any of them will ultimately be implemented. The Berlin SPD is in the process of debating and drafting potential legislation for its five-year rent freeze, which it hopes to be able to finish this summer. The party has already cleared the first hurdle: having experts determine that the city is legally able to set its own housing policy. And the proposal to break up large rental companies looks set to gain the requisite 20,000 signatures needed to trigger an official petition for a referendum in the coming months.